Sponsored by the Sta. Rita Hills Winegrowers Alliance, the 2nd Annual Wine & Fire event was held June 22-24, 2007. The title refers to the featured wines and fire-grilled foods served at the celebration. The Grape Radio crew consisting of Mark Ryan, Eric Anderson, and myself hunkered down in Lompoc which abuts the western edge of the Sta. Rita Hills appellation. 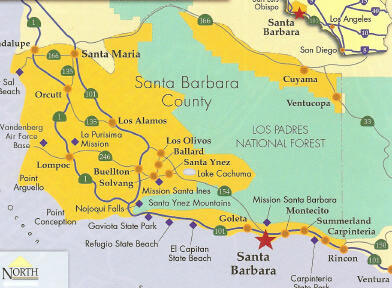 Lompoc will never be confused with affluent Santa Ynez, which is more synonymous with Santa Barbara wine country, and located 30 minutes east by car along Hwy 246. However, Lompoc, the “City of Arts & Flowers,” is renowned for its affectionately termed “Wine Ghetto,” where many of Sta. Rita Hills’ finest producers craft Pinot Noirs of great distinction. Close by is the “Wine Prison,” also known as “Pinot West,” which is another industrial park that is close to the federal penitentiary and home to several other notable winemakers. A few wineries do make wine within the Sta. 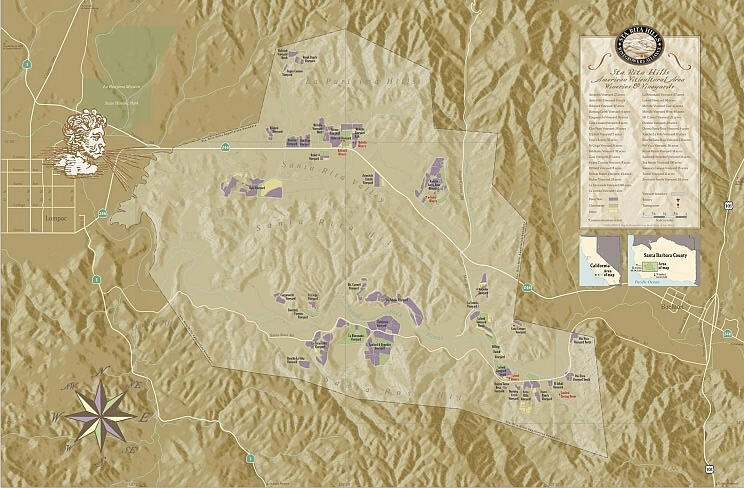 Rita Hills appellation (Lompoc sits just west of the appellation - see map on page 2), such as Babcock Winery & Vineyards, Foley Estates Vineyard & Winery, Lafond Winery & Vineyards, Melville Vineyards & Winery, and Sanford Winery & Vineyards. There is a new winery complex ( Rancho La Vena Winery) being constructed on Santa Rosa Road in the appellation that will be a shared home to several local producers. We had a ton of fun at this event, and as I unravel the story of the weekend, you will see why. 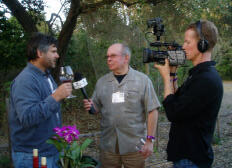 Mark (right with Eric and Peter Cargasacchi) handled the camera duties as we videotaped many interviews of winemakers and winegrowers for a later program on Grape Radio (www.graperadio.com). Being a young, good looking and unattached guy, he also was on the prowl for young available talent in the area. Eric can always be recognized by his hefty backpack which is stuffed with still cameras and more high-powered zoom lenses than a anyone should reasonably possess. He is often seen with his cap backwards in his photography mode (left). Look for Eric’s photos on his website, www.grape-nutz.com. I held no distinction among the trio other than that I lent some royalty and seniority to the group. This map of the Sta. Rita Hills Winegrowers Alliance is also available for viewing or purchase on the website at www.staritahills.com. 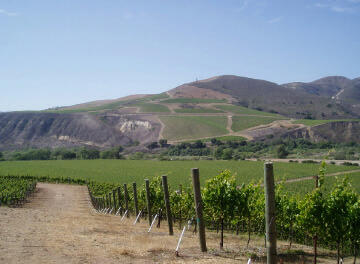 The Santa Rita Hills is a western subdivision of the much larger Santa Ynez Valley Appellation. Officially, the Santa Rita Hills Appellation is Sta. Rita Hills, since Vina Santa Rita, a 123-year-old winery in Santiago, Chile, filed suit in 2001 to stop California vintners from using the Santa Rita Hills name. Sta. Rita Hills is pronounced the same, but reads a little awkwardly. The Sta. Rita Hills Appellation is one of the few areas along the California Coast where the mountains run east-west instead of north-south. The result is a gap that allows cooling Pacific Ocean winds to flow inland. When it is hot in Santa Ynez which is 10 miles to the east, it is 10 degrees cooler in the western Sta. Rita Hills. Fog hovers over the vines until mid-morning, and the temperature barely rises above 75 degrees in the western reaches of the appellation. Well-draining calcerous soils (limestone, chalk and clay) combine with the cool climate to make this area ideal for growing Pinot Noir and Chardonnay. The appellation spans 30,720 acres of which 1,647 acres are planted to grapes, mostly Pinot Noir with smaller amounts of Chardonnay (300 acres), Pinot Gris and Syrah. The photo below is looking north across the Fiddlestix Vineyard on Santa Rosa Road towards the hillside Sea Smoke Vineyards in the Santa Rita Hills. Day 1 The event kicked off on Friday evening with the “Wine Reception Under the Stars” held at the historic La Purisima Mission in Lompoc. La Purisima was the eleventh of the twenty-one Spanish missions built in what became California. Misión de La Purisima Conceptción de Maria Santisma was founded in 1787 by Franciscan Padre Presidente Fermin Francisco Lasuén. The 1812 earthquake destroyed several of the mission buildings and the mission was subsequently relocated four miles to the northeast where it was officially established in 1813. Today La Purisma Mission is a State Historical Park and is the most completely restored mission in California. Historically the Mission grape was planted here by the padres, but currently there is no vineyard on the property. Deborah Hall, owner of Gypsy Canyon Winery in the Sta. Rita Hills, has been donating cuttings for the establishment of Mission grape vineyards in a number of missions in California and hopefully La Purisima will follow suite in the future (see feature on Deborah Hall and Gypsy Canyon on page 14). The evening was quite enchanting with winemakers pouring among the La Purisima Mission gardens, pathways glimmering with candles, ranchero-era music filling the air, and the heady aromas of firegrilled delights including gourmet flatbreads, paella espana, and rosemary pomegranate roasted Rinconada Dairy lamb all prepared by local chefs. 29 of the winery members of the Sta. Rita Hills Winegrowers Alliance were presenting their Pinot Noir and Chardonnay wines. Some notes on the participating wineries follow. Alma Rosa Winery & Vineyards The founders of Sanford & Benedict Vineyard (1971) and Sanford Winery (1981), Thekla and Richard Sanford started their own new winery in 2004 with a commitment to sustainable farming and green business practices. When Richard left Sanford a few years ago, he retained over 100 acres of certified organic estate vineyards. On July 1, 2007, Richard will return to his roots when Alma Rosa takes over the original Sanford tasting room at 7250 Santa Rosa Road. It is an undistinguished and well-worn small building with a corrugated aluminum roof, but it has become legendary for its prominent part in the early scenes of the movie Sideways. As Miles and Jack sip a 1999 Sanford La Rinconada Pinot Noir, Miles waxes, “Lovely, big and gamy, almost irreverent for a Pinot. I like it. A perfect beginning to this weeklong adventure.” The long time friend of Richard’s, Chris Burroughs, will continue to be manager. 1,500 cases, $49, screw cap. · The La Encantada has fabulous bright cherry aromatics, deep berry flavors with earth, spice and anise overtones, and a beautifully balanced format. 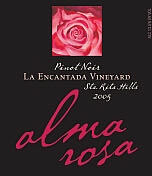 The wines are available on the website at www.almarosawinery.com. 805- 688-9090.
ampelos cellars A few years ago, Rebecca and Peter Work started this small family operation focusing on Pinot Noir and Syrah. The wines are crafted with loving hands at “Pinot West,” and biodynamic farming is employed at the estate vineyard in the Sta. Rita Hills. Ampelos is Greek for “vine.” The Works have close ties to Greece, having been married on a small Greek Island and fell so much in love with the island, they created a small bed and breakfast there (www.ampelosresort.com). Peter’s son, Don, is the assistant winemaker at Sea Smoke Cellars and assists at ampelos as well. 2005 ampelos vineyard Lambda Sta. 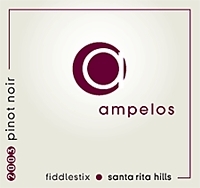 Rita Hills Pinot Noir $35, 2004 ampelos Vineyard Rho Sta. Rita Hills Pinot Noir 98 cases, $45 (the two wines are from the same vineyard but the Lambda is aged in 33% new French oak and the Rho is 4 select barrels that are aged longer in 50% new oak), and 2005 ampelos Fiddlestix Vineyard Sta. Rita Hills Pinot Noir $35. I tasted the wines briefly at Sunday’s Open House and I feel this is a producer worth your interest. The 2005 Lambda Estate Pinot Noir (Pommard 4 and Dijon 115) was quite nice with a remarkably spiced fruit compote finish that lingered an eternity. Terrific! The wines are available on the website, www.ampeloscellars.com. 805-736-9957. Arcadian Winery Winegrower Joe Davis is a believer in Old World (Burgundy) methods of crafting fine Pinot Noir and Chardonnay. A classicist, his wines often need a few years to really offer their charms. As writer Dennis Schaefer has said, “Almost every winemaker who makes Pinot Noir professes to follow the Burgundian model. And, more or less that’s true. But with some winemakers, the ‘less’ part is apparent, and plenty of shortcuts may be employed. With winemaker Joe Davis, everything is always ‘more’ Burgundian.” Joe owns no vineyards, but spends considerable time in his contracted vineyards, making him as much a farmer as a winemaker. A blend of clones 115 and 667 · This is more restrained than many Sta. Rita Hills Pinot Noirs featuring tart cherry flavors and bracing acidity. This won’t disappoint at the dinner table. $50. Joe says the grapes from Fiddlestix can have considerable structure and tannin and it takes some clever skill to “tame the beast.” · This is a current release and shows off what Joe’s wines do with a little bottle age. Plenty of complexity here with charming earth, leather and soy notes and dusty tannins. Joe’s lineup of wines may be ordered from the website at www.arcadianwinery.com. 805-686-5501. Babcock Winery & Vineyards Bryan Babcock has been crafting terroir-driven wines in the Sta. Rita Hills since 1984 when he joined his father, Walt Babcock who had purchased 110 acres of land in the Santa Rita Hills region in 1979. Today, Babcock Winery & Vineyards is a 20,000-case-a-year winery with 80 acres planted to multiple varietals including Pinot Noir. Www.babcockwinery.com. BADGE Bruno D’Alfonso has been making Pinot Noir from the Santa Rita Hills for over 17 years. While working at Sanford Winery, he developed his private label, Di Bruno, which focuses on Italian varietals. In 2003, he added BADGE to his portfolio. The name comes from a song sung by the band Cream, written by George Harrison and Eric Clapton. I thought the 2004 BADGE Sta. Rita Hills Pinot Noir was very good. $30. · Has not warmed my heart. I have sampled it at home and at the event and found it to have green pepper among the fresh fruit aromas in the nose with oak and herbs dominating the finish. The wine is distributed to fine retail stores. Cargasacchi Winegrower Peter Cargasacchi farms two vineyards, the Cargasacchi Vineyard at the western end of the Sta. 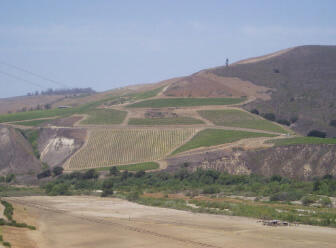 Rita Hills Appellation (planted in 1999), and the Jalama Vineyard outside of Lompoc. He crafts Pinot Noir, Syrah and a Rosé of Sangiovese under his own labels Cargasacchi/Pt. Concepcion, and supplies grapes to several fellow Alliance members. He is known as a meticulous farmer and his wines to date have been well-crafted. 250 cases, $44. · Tasted briefly at the Friday evening event, I found it to be a red fruit-driven wine with considerable appeal. Some cotton candy in the nose. Primarily red cherries and berries in the flavors with noticeable oak in the finish (should integrate over time). Peter’s Point Concepcion Pinot Noirs tend to be less muscular and more elegant in style, intended to be very food-friendly. The website is www.pointconcepcionwines.com. The wines are distributed to retail stores. 805-736-7763. Carr Vineyards & Winery A small boutique winery that focuses on Pinot Noir from vineyards in the Sta. Rita Hills Appellation managed by Ryan Carr. The winery grew out of a partnership between Ryan Carr and Andy Kahn (Kahn Winery) who formed a vineyard development company. Together they manage 100 acres of vineyards in Santa Barbara County including the Ovation Vineyard and Turner Vineyard in the Sta. Rita Hills Appellation. The winery was established in 1999 in downtown Santa Barbara. A 1940s-era Quonset hut with a faux cave interior tasting room is located at 414 N. Salsipeudes and is open 11-5 daily. The wines are available on the website, www.carrwinery.com. Current Pinot Noir releases are 2005 Carr Three Vineyards Sta. Rita Hills Pinot Noir 445 cases, $30, 2005 Carr Clos Pepe Vineyard Sta. Rita Hills Pinot Noir 98 cases, $40, and 2005 Carr Turner Vineyard Sta. Rita Hills Pinot Noir 217 cases, $35. My tasting experience is limited. Casa Cassara Winery & Vineyard This estate sits high atop a wind-swept knoll in the heart of the Sta. Rita Hills appellation, just off Santa Rosa Road. Bernie Cassara bought this property as a family retreat back in 1981 and planted the first 8 acres of vines in 1990. The winery was bonded in 1997, and in 1999, 40 cases of Pinot Noir were produced. A modern winery was constructed and utilized for the 2004 vintage. I visited some time ago and at that time there was still a winding and steep dirt road heading up to the residence and winery. I tasted with sales manager Alicia Summers and winemaker Brian Freeborn and thought the wines were quite decent. The emphasis is on the Estate Pinot Noir. $24. · This is a big wine with a bright nose of amped-up cherries. The mid-palate is saturated with Pinot fruits and the finish is clean and satisfying. Since the winery is inaccessible, a new tasting room, scheduled to open this month, is at 291 Valley Station in Buellton, on the south side of Hwy 246. The website is www.casacassaracom. 805- 688-8691. Clos Pepe This 28-acre vineyard lies in the heart of the appellation on Hwy 246. Small quantities of Pinot Noir and Chardonnay are produced and grapes are sold to several members of the Alliance. Vineyard manager and winemaker Wes Hagen is a believer in the New World “Caliesque” style of Pinot Noir characterized by prodigious extraction. Noted winemaker Ken Brown has called grapes from his vineyard, “grapes on steroids,” but some wines, notably from Ken and A.P. Vin, seem to temper the muscular fruit. The vineyard is named after operations manager Steve Pepe. A masculine and firm wine with concentrated fruit and notable oak and tannins. What some might call “power to thrill,” the wine is generous and fruity rather than complex. The lingering finish is tinged by some heat. Aging will mellow this wine. The website, www.clospepe.com, is very informative including photos of a year in the vineyard. Wines (including a Chablis-styled Chardonnay) may be purchased from the website. Demetria John Zahoudanis, a native of Greece, purchased land from two established sites in Santa Barbara County. The Demetria Vineyard (formerly the Andrew Murray Vineyard) is located in Santa Ynez Valley and is suited to Rhone varietals. The Gaia Vineyard (formerly Ashley’s Vineyard planted in 1999 to Pinot Noir, Chardonnay and Pinot Blanc) is one of the coolest sites at the western boundary of the Sta. Rita Hills Appellation. You may continue to see the name Ashley’s Vineyard on labels from wineries that source grapes from the Gaia Vineyard. The Gaia Vineyard label is dedicated to Burgundian varietals. The vineyards are managed by Jeff Newton of Coastal Vineyard Care. 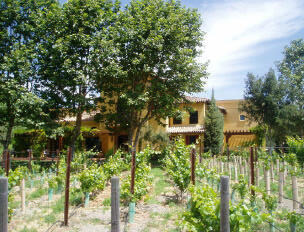 The Mediterranean- styled winery (purchased from Andrew Murray in 2006) is located in Los Olivos at 6701 Foxen Canyon Road. The inaugural releases from the 2005 vintage were carefully crafted by winemaker Mike Roth who has experience in California’s Napa, Sonoma and Santa Barbara regions. 14.5% alc., 297 cases, $45. Dijon clones 114 and 777. · The shy nose can be coaxed with swirling to reveal black cherry and spice. The flavors feature dark fruits with soy, tea and tobacco. The texture is soft and alluring, the finish taut and woodsy. 14.9% alc., 247 cases, $55. Pommard and Dijon clone 777. · Earthy, smokey and forest floor aromatics lead to satisfying black cherry and anise flavors. The tannins are fine-grained and the overall impression is finesse. The alcohol can peak out as the wine warms in the glass. 14.2% alc., 725 cases, $35. Dijon clones 114 and 777. · This is a beautifully crafted wine that grows on you over time. The nose is flush with woodsy and barnyard aromas. A charming cherry core of fruit is enhanced by spice and mocha. Nicely balanced and easy to drink, this is the most approachable wine of the trio. The first two wines are still reticent and will reward reassessment in a few years. The wines may be purchased from the website at www.demetriaestate.com. Flying Goat Cellars Master winemaker Norm Yost , with a quarter of a century of vintages under his belt, specializes in producing limited quantities of vineyard designated Pinot Noirs from the Central Coast region of California. He has recently also made a sparkling wine called Goat Bubbles. As the chief goat herder, Norm tries to downplay the pretentiousness often found in wine circles. His vineyard sources include Salisbury Vineyard in San Luis Obispo, Dierberg Vineyard, Solomon Hills Vineyard and Nielson Vineyard in the Santa Maria Valley, and Rancho Santa Rosa Vineyard and Rio Vista Vineyard in the Sta. Rita Hills. $45. · Both 2004 and 2005 wines exhibit beautifully balance with scrumptious cherry fruit and deft touch of oak. They both have lovely depth and richness of flavor that carries over to a finish of great persistence. Highly recommended. Clones 115, 667 and 777. The wines are available from the website, www.flyinggoatcellars.com. Tasting by appointment, 805-688-1614. Foley Estates Vineyard & Winery This is a showcase property in the Napa mode located along Hwy 246 in the northern part of the appellation. The beautiful tasting room is open daily from 10-5. Owner William (Bill) Foley II purchased the Rancho Santa Rosa in 1998 and planted 230 acres to Pinot Noir, Chardonnay and Syrah. The winemaking team consists of Alan Phillips (most recently of Byington Winery in the Santa Cruz Mountains), assistant winemaker Maurice Boyd, and enologist Colin Murphy (all of whom also produce wine for Lincourt Vineyards in the Santa Ynez Valley which is also owned by William Foley II). The Rancho Santa Rosa Vineyard has 32 different blocks of Pinot Noir. Both composite wines and single clone wines are produced. Alan Philips has reported an experiment in which every other row of a particular vineyard block was picked at either 24 or 27 brix, then fermented separately and after finishing, given blind to tasters to evaluate. None of the tasters preferred the overripe versions of the wine. The large acreage here and the extensive winery resources allow for considerable experimentation which should pay off down the line in the quality of the wines emerging from this winery. $45. 2A is the Wädenswil clone. · An opulent Pinot Noir featuring bright berry fruit with charming silkiness which is marred only by a herbal and oak dominated finish. The lineup of wines are available on the website, www.foleywines.com. The Gainey Vineyard Gainey is located in Santa Ynez, but owns the Evan’s Ranch cool-climate vineyard on Santa Rosa Road in the south-west region of the Sta. Rita Hills Appellation. Established in 1984, Gainey is a pioneer in establishing the Santa Ynez Valley as a world-class wine region. For a number of years, Rick Longoria was the winemaker here. The current winemaker is Kirby Anderson. 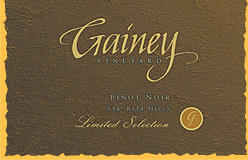 The website is www.gaineyvineyard.com. 805-688-0558. 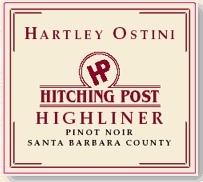 Hitching Post Hartley-Ostini Frank Ostini a chef, and Gray Hartley, a fisherman, make handcrafted Pinot Noirs from vineyards in Santa Barbara County. The Sideways movie really put this label in the limelight but these two nice guys deserve all the notoriety they receive. 4700 cases are produced annually at Central Coast Wine Services in Santa Maria. 325 cases, $50. 4 clones, 2 different rootstocks, picked in separate passes through the vineyard. · This wine is meaty and thick with lavish and rich, mature dark fruits. There is plenty of earthiness and mushroom flavors. A fruit bomb with judicious use of oak. 220 cases, $42. · A little barnyard livens up the aromatics leading to plenty of candied Pinot fruits, especially frambiose. Elegant in style and rather simple in focus, it is perfectly fine. The Hitching Post Pinot Noirs are available at the Hitching Post II Restaurant on Hwy 246 in Buellton and distributed widely to fine wine shops. They are also available from the website order form, www.hitchingpostwines.com. 805-688-0676. Huber Cellars This is a small family-operated estate specializing in Chardonnay and Pinot Noir. The estate vineyard was planted in 1986 making it one of the oldest vineyards in the Sta. Rita Hills Appellation. 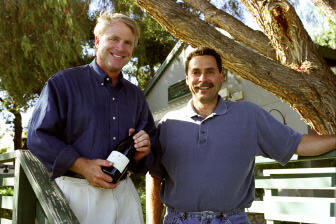 The proprietors, Norm and Traudl Huber, debuted their first wines in 2000 with Norm Yost as the winemaker. They bottle a barrel and stainless steel fermented Chardonnay, both of which are quite good. The estate Pinot Noir has been well-received by the wine press. The Pinot Noir block in the vineyard was planted to clone 115 in 1995. The German red varietal, Dornfelder, is also grown here. Www.hubercellars.com, Tasting at the winery in the Lompoc Wine Ghetto is by appointment . 805- 736-3859. I have sampled this on several occasions when young. As Ken said, the wine “drank like a Cab, but oh what a ride!” However, with a few years of age, the wine now showed more restraint and polish. The rough edges had disappeared, the tannins had softened, and the aromatics were more bright and persistent. 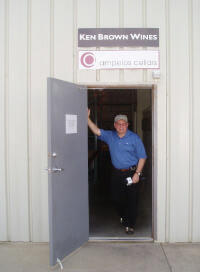 It is still a hulk of a wine, but more calm and well-behaved..
Ken Brown Wines are sold through the website at www.kenbrownwines.com. Tasting by appointment, 805-688-4482. Kenneth-Crawford This label is a collaboration between two young and talented winemakers, Mark Crawford Horvath and Kenneth (Joey) Gummere. Pinot Noir and Syrah are sourced from top vineyards in the Sta. Rita Hills appellation. $45. · A nice offering featuring black and blue fruits, baking spice and black pepper. The nose and palate are deep and satisfying and the close is clean and fresh. Nice guys, nice wine. The wines are available from the website at www.kennethcrawford.com. 805-693-1340. Lafond Winery & Vineyards The original Lafond Vineyards were planted in 1972 and with subsequent planting the total acreage now is just under 100 acres off Santa Rosa Road in the south-west corner of the appellation. Talented and affable winemaker Bruce McGuire works with eight different Pinot Noir clones and bottles an Estate Pinot Noir as well as single clone wines, 113 and 777. The winery and tasting room are beautifully designed to take advantage of sweeping views over the adjoining vineyards. 14.7% alc., 164 cases, $38. · Clone 777 is considered a complete clone in the sense that it can often make a good wine on its own. This wine has the typical black fruit profile of 777 with nice integration of oak and alcohol. The finish shows a tangy acidic edge. 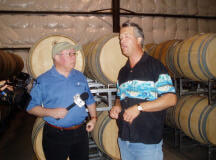 Owner Pierre Lafond maintains a very informative website at www.lafondwinery.com. 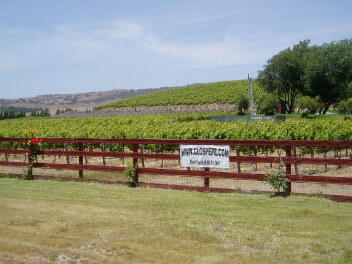 The winery’s tasting is open daily from 10-5 at 6855 Santa Rosa Road. 805-688-7921. 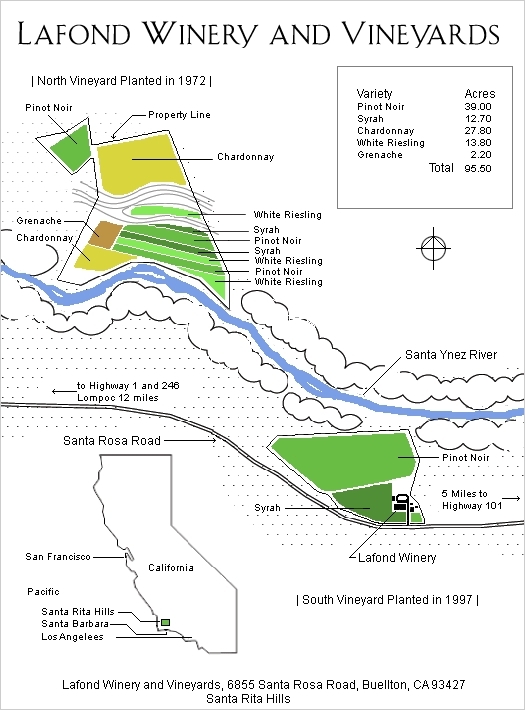 A very nice map of the Lafond Vineyard is on the website and is reproduced here for your reference. Bruce McGuire is pictured below. Longoria Rick Longoria is a veteran winemaker in Santa Barbara County. He appeared on the local scene in 1976 after spending two years at Buena Vista Winery where he developed a lifelong friendship with Andre Tchelistcheff. He crafts 3,500 cases of several varietals from his winery in Lompoc under the Longoria label (established 1982). His featured Pinot Noir is sourced from his 8-acre estate Fe Ciega Vineyard located in the south-west part of the appellation. He also sources grapes from Rancho Santa Rosa, Bien Nacido Vineyard, and Sanford & Benedict Vineyard. I can remember way back in the early 80s when I first became really captivated by Pinot Noir and Longoria Pinot Noir was one of the labels I sought out as one of the few at the time to show the promise that has eventually come to pass. 770 cases, $48. Rick believes in a diversity of clones and planted Pommard, 115, and 667 here in 1997. · The nose is rich and flamboyant with attractive toast, spice and dark cherry aromas. There is a nice follow through with dusty tannins and a touch of herbalness and oak on the finish. This vineyard produces concentrated fruit, and this wine has what the French call croquent, a concentrated core of flavor much like a crunchy hard candy. You can shop online at www.longoriawine.com. Check out the “Blues Cuvee” lithographs for sale. 866-759-4637. The tasting room is open daily at 2935 Grand Ave, Los Olivos, 805-688-0305. Loring Wine Company Brian Loring crafts multiple vineyard designate Pinot Noirs (14 at last count) from notable growers throughout California. A self-admitted “Pinot Freak,” Brian was one of the first boutique Pinot Noir producers to enter the business “cold” so to speak (he was a software engineer). He started humbly, with 150 cases in 1999, and has never looked back. His Pinot Noirs have never been bashful and have led the charge for a style that shows off deeply extracted and flamboyant fruit. He has definitely had his critics among the classicists, but he has stood firm and pursued his vision. Read more: PinotFile Vol 6, Issue 25. Muscular from toe to toe, this is brimming with black cherry, cassis and plum reduction sauce. The wine is still un-evolved and awkward with the core of unctuous fruit outdone by oak and a tannic finish. Loring wines are sold primarily through a mailing list. The website is www.loringwinecompany.com. The winery is located at 1601 W Central Ave, Unit F, Lompoc. Tasting by appointment. Melville Melville has large plantings of Pinot Noir and Northern Rhone varietals along Hwy 246 in the more easterly portion of the Sta. Rita Hills Appellation. The modern winery and hospitality center is quite striking. Greg Brewer (also of Brewer-Clifton) shares the winemaking duties here with Chad Melville. An estate Pinot Noir is reliable and four special bottlings feature specific clones and/or blocks of the vineyard are snapped up by pinotphiles. There is also a Verna’s bottling from Melville’s Los Alamos vineyard. The wines are sold to a mailing list that can be accessed at www.melvillewinery.com. The winery tasting room is open daily from 11-4 at 5185 E Hwy 246, Lompoc. (it can be crowded on weekends with large groups of tasters). 805-735-7030. Ortman Family Vineyards This label is led by the father-and-son winemaking team of Chuck and Matt Ortman (Chuck Ortman was the long time winemaker at Meridian). 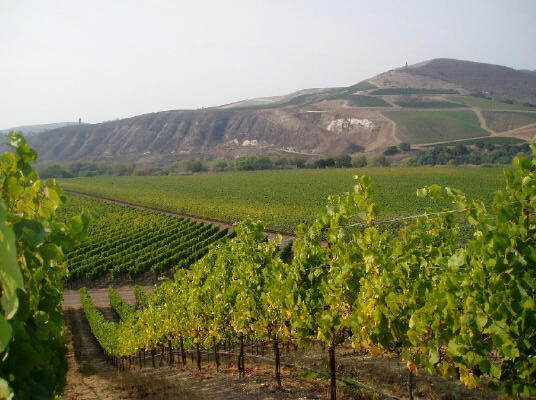 Located in the San Luis Obispo Appellation, they source Pinot Noir from Fiddlestix Vineyard. 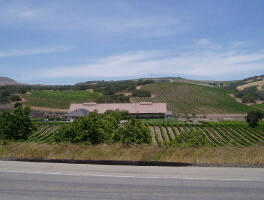 The tasting room is located in Edna Valley at 3080 Biddle Ranch Road, San Luis Obispo. $34. · The red fruit aromas are pleasing, and the raspberry jam flavors are a bit lean, but satisfying. Pali Wine Company This newer producer is a collaboration between multiple wine enthusiasts who agreed to finance a new winery in Lompoc in exchange for Brian Loring’s winemaking skills. The Pali wines are made in Lompoc by Brian Loring and are similar in style to Loring’s own label. 130 cases, $44. The Turner Vineyard is just east of the Fiddlestix Vineyard on Santa Rosa Road. · This wine is quite decent with lovely aromatics of cherry and spice, a solid core of red and blue fruits, and lively acidity on the finish. Pali wines are distributed to fine retail stores and are sold to a mailing list at www.paliwineco.com. The winery is located at 1601 W Central, Unit F2, Lompoc. 805-736-7200. BTW, the 2005 Pali Wine Company Shea Vineyard Pinot Noir is a killer. Rozak This 14-acre estate vineyard planted to Pinot Noir and Chardonnay is in the northern part of the Sta. Rita Hills Appellation. The vineyard is named Rozak Ranch Vineyard and the winery is called Rozak Vintners. The winemaker is Randy Rozak. Tastings by appointment. 805-736-1184. Rusack This beautiful winery in the hills above Solvang features a husband and wife winemaking team, John and Helen Falcone. The wines here have improved dramatically since they took over the reigns. The owners are Geoff and Alison Rusack (Geoff is pictured left below and John on the right). Output is now 7,500 cases. The tasting room and adjoining picnic area is located at 1819 Ballard Canyon Road (see website for directions) and is open daily from 11-4. 14.5% alc., 445 cases, $38. This wine is composed of the best barrels from Fiddlestix Vineyard (50%) and Rancho Santa Rosa Vineyard (50%). 35% new French oak in the élevage. · This wine was one of my favorites that I tasted at the event. Deep red fruits with cinnamon and earth drive the flavors and a nice sweet cherry finish leaves a lasting impression. The texture is silky and comforting. A little heat peaks out on the nose but it is not obtrusive. Rusack wines are sold through the website, www.rusack.com, and are sensibly priced. 805-688-1278. Sanford Sanford Winery was started in 1981 by Richard Sanford, but financial and corporate issues led him to leave the winery a few years ago. Sanford has chosen to expunge all mention of Richard on their website. The focus of Sanford, now owned by the Terlato Wine Group, still remains Pinot Noir and Chardonnay. This month, Sanford opened a new tasting room at the La Rinconada Winery and Vineyard at 5010 Santa Rosa Road in Lompoc (open 11-5). The winemaker is Steve Fennell. This is a superb vineyard and Pinots I have had from here have been outstanding and very age worthy. This wine is no exception. Fabulous aromatics of spice and bright ripe cherries, meaty flavors of toasty Pinot fruits highlighted with licorice, and a finish that leaves you asking for more. There is a certain pedigree to the fruit here (the vineyard is adjacent to Sanford & Benedict Vineyard) and this wine struts a certain charisma that is other worldly. The Sanford wines are sold through the website at www.sanfordwinery.com. 805-688-3300. The 2005 vintage of this wine has not yet been released. Sea Smoke Has there been another producer of Pinot Noir in California that has caused as much buzz among Pinot enthusiasts? The emphasis here is on meticulous management of the vineyards using a combination of cutting-edge technology and a highly skilled vineyard team. The winemaker is Kris Curran, who also produces Rhone varietals and Sangiovese under her namesake label in Lompoc Owner Bob Davids began the development of Sea Smoke Vineyard in 1999 on the south-facing hillsides of the estate situated above Fiddlestix Vineyard. 10 clones are planted in multiple blocks on the 100-acre estate vineyard (detailed on the website). The first vintage was 2001 and production is now up to 3,000 cases per year. $54. · The wine had been bottled only one month previous and was still a little closed. Despite this, it was obvious there was terrific stuffing here. The aromatics are very expressive of ripe fruit, and the tannins are reigned in. This is definitely a large scale, fruit-powered Pinot Noir that will appeal to lovers of a hedonistic style. There are two other bottlings, Botella and Ten. A Chardonnay is given away to faithful mailing list members. The Sea Smoke lineup of Pinot Noirs are a hot ticket and sold primarily through the mailing list at www.seasmokecellars.com. Allocations are tight and there is a waiting list to get on the mailing list. No tasting. Other producers using fruit from the Sta. Rita Hills Appellation worth trying: A.P. Vin, Au Bon Climat, Brewer-Clifton, Carlson, Drew Family Cellars, Foxen Vineyards, Margerum Wine Company, Ojai Vineyard, Paul Lato, and Samsara. 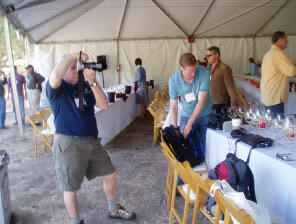 Day 2 A day-long seminar, Trial by Fire, was held under a big tent at Rancho La Vina, in the heart of the Sta, Rita Hills. Rancho La Vina has been in the same family since 1868. The bottom land is farmed to walnuts, beans, mustard, alfalfa and flowers, while the mesas are planted to vineyards. Four individual sessions were conducted with panels of winemakers. Audience members were encouraged to participate as jurors (put the winemakers “on trial,”) and the winemaker-panelists presented their Sta. Rita Hills wines to support their positions. There was a lot of spirited banter and laughter throughout the day. The first panel was “Chardonnay and Oak: A Marriage Made in Heaven or Hell? Although the Sta. Rita Hills is best known for Pinot Noir, Chardonnays from this region are excellent. 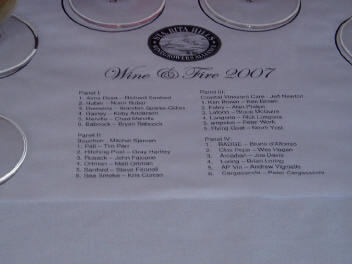 Both oaked and nonoaked types were presented for tasting by Alma Rosa, Huber, Demetria, Gainey, Melville and Babcock. The unoaked varieties have bright acidity and a wet stream bed minerality. The oaked styles have softer acidity and more cheesy, buttery and creamy tones. It was pointed out that wine critics like oaky Chardonnay, but sommeliers prefer non-oaked Chardonnay, yet sommeliers often retain a few oaky high-scoring Chardonnays on their restaurant wine lists for customers. Regardless of the style of Chardonnay you prefer, look to the Sta. Rita Hills as a reliable source for fine Chardonnay. The second panel was “Sta. Rita Hills Pinot Noirs on the Table.” Kris Curren made a very important point at this session. She said “that white wines are often served way too cold and red wines are served way too warm.” The ideal temperature for both Pinot Noir and Chardonnay is 58 degrees. As Pinot Noir warms above 58 degrees, the volatile esters which add so much to the aromatics disappear and alcohol and earthy features take over. I would add that Chardonnays are almost always served too cold in restaurants. Ask the waiter/waitress to put your filled glass into the microwave for about 10 seconds. This will warm it up to an acceptable drinking temperature without harming the wine. Nix the ice bucket. There was quite a lot of discussion over bottle closures but when the audience was polled, most preferred cork stoppage on red wines. The third panel was titled “Clones and Terroir.” In the early days of planting of Pinot Noir in Santa Barbara County, Martini Clone 13 was widely used. Today, in the Sta, Rita Hills, Dijon clones 667 and 777 are very popular along with 113, 115 and some 828 and 459. There are also substantial plantings of 2A and Pommard 4. So far, heritage clones have performed well, but they are sparsely planted. The conclusion of this panel was that clones are not the trump card, the site is the trump card. A poor site will not allow even the best clones to perform well. Clones are very expressive of the site, so flavors in the wine will vary depending on the site. The fourth panel was a discussion of “The Vineyardist and the Winemaker - Nature or Nuture.” Needless to say, with Bruno d’Afonso, Wes Hagen, Joe Davis, Brian Loring and Peter Cargasacchi on this panel there was a lot of sniping and friendly bickering. 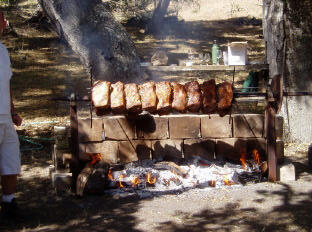 A gourmet, ranchero-inspired luncheon feast was prepared over an open oak fire and served under the majestic oaks. Among the treats were spit-roasted baron of Santa Rita Hills beef and oakbarbecued Cal Poly capon. Day 3 There were a number of Sunday Open Houses at wineries. 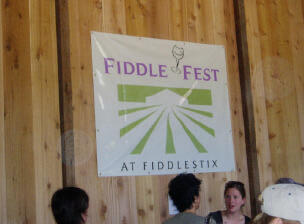 I attended the Fiddlefest at Fiddlestix Vineyard. 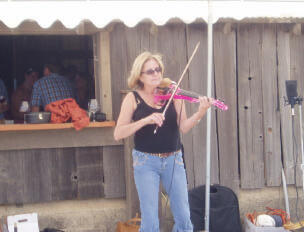 All 14 producers of Pinot Noir sourced from Fiddlestix Vineyard were pouring their wines in Kathy Joseph’s barn. Outside there was bluegrass and fiddlin’ music (see the Pink Fiddler below), and delicious barbecue catered by Hitching Post II was savored by all. 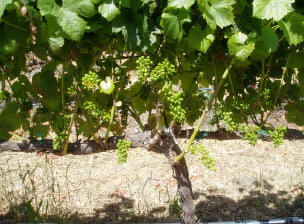 Fiddlestix Vineyard is located at mile marker 7.28 on Santa Rosa Road. Located on the north side of a tight east-west running valley across from the Sanford & Benedict Vineyard, fog hangs over the vines until mid-morning, the temperature barely rises above 75 degrees, and the coastal breeze blows through daily, ensuring cool grapes receive a lengthy day of sunshine. The soil is well-drained Gazos and Botella clay loam, loaded with chirt and Monterey shale. The Fiddlestix property was purchased in 1996 and planting began in 1998. There are 97 acres of Pinot Noir in 34 individual blocks, planted with six different clones - Dijon clones 113, 115, 667, 777, Pommard clones 4 and 5, and a Swan selection. 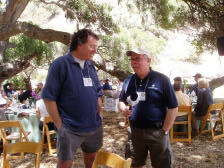 Fiddlestix is farmed by Coastal Vineyard Care under the leadership of Jeff Newton and Larry Finkle. The vineyard foreman, Rafa Medina, has been at Fiddlestix from the beginning. The participating wineries included Anglim Winery, Arcadian Winery, Bonaccorsi Wine Company, Dragonette Cellars, Fiddlehead Cellars, Gainey vineyard, Harley-Ostini Hitching Post Wines, Ortman Family Vineyards, Pali Wine Company, Paul Lato, Prodigal, RN Estate, Rusack, and Summerland Winery. A few wines really stood out to me. Kathy Joseph was pouring a vertical of her Fiddlehead Lollapalooza, 2001 through 2004. The wines are all sensual and delicious, but the additional aging on the 2001 and 2002 has worked wonders and these were startling good. The lesson to be learned here is be patient with some of your Pinot Noirs as they will benefit from a couple years of cellaring. RN Estate is a winery in Paso Robles that specializes in red Rhone and Bordeaux varietals. Owner and winemaker, Roger Nicolas, is a former restaurateur whose Fiddlestix Pinot Noir has a French sensibility and breeding. Roger was born in France and came to the United States at the age of 20. During his years of working at and owning prestigious restaurants, he dreamed of crafting his own wines. With the 2005 vintage, his dream has been realized. The 2005 RN Estate Fiddlestix Vineyard Sta. Rita Hills Pinot Noir 175 cases, $45. Very, very good and the 2006 barrel sample is following instep. The fruit had great purity and several layers of flavor. There was finesse and gossamer tannins and a clean finish. Sometimes you find great Pinot when you least expect it. To order, contact Roger at rnicolas@ rnestate.com or phone 805-610-9802. The website is www.rnestate.com. Prodigal Wines is a new Pinot Noir specialist located on Santa Rosa Road founded by Steve and Mary Russell. They make Pinot Noir from their own estate Quinta Santa Rosa Vineyard as well as other premium vineyards in the appellation. Steve was pouring his 2006 Prodigal Fiddlestix Vineyard Pinot Noir Barrel Sample. Like his 2005 Pinot Noirs (2005 Sta. Rita Hills Pinot Noir, 2005 Sta. Rita Hills Estate Grown Pinot Noir) which I have tasted and will be released later this summer, this wine had considerable charm and refinement. Steve has a way with Pinot. He will be crafting his wines at the soon to be opened Rancho La Vina Winery on the site of a former walnut grove on Santa Rosa Road. Join the mailing list on the website at www.prodigalwines.com. Call Steve or Mary at 805-688-0476 for an appointment to taste. In 1999, Michael and Jenne Lee Bonaccorsi formed the Bonaccorsi Wine Company. Since Michael’s untimely passing, Jenne has carried on. Both the 2004 Bonaccorsi Wine Company Fiddlestix Vineyard Sta. Rita Hills Pinot Noir and the 2005 Bonaccorsi Wine Company Fiddlestix Vineyard Sta. 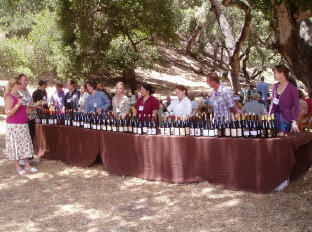 Rita Hills Pinot Noir were poured at the event. Both wines were impressive, seductive and just plain delicious. On August 5, in Los Angeles, Jenne is hosting a Central Coast Wine and Food Festival at Wally’s Wine Store in West Los Angeles to benefit her deceased husband’s scholarship fund at the University of California Davis. For information and tickets, go to www.bonaccorsifoundation.com or www.wallywine.com. More details in the PinotFile, Volume 6, Issue 31. The winery website is www.bonawine.net. Other wines of note were the 2002 Arcadian Fiddlestix Vineyard Sta. Rita Hills Pinot Noir (previously reviewed in this issue), the 2006 Paul Lato Fiddlestix Vineyard Sta. Rita Hills Pinot Noir Barrel Sample (50 cases - a total of 6 barrels were made but only 2 barrels lived up to his strict expectations, so 4 barrels were declassified. Paul is a perfectionist and his wines always show his passion and commitment. ), 2005 Rusack Reserve Sta. Rita Hills Pinot Noir (previously discussed in this issue), and the 2005 Summerland Winery Fiddlestix Vineyard Sta. Rita Hills Pinot Noir.